If you have a wooden fence, you want it to last as long as possible. Not only does it provide privacy, but it likely enhances the beauty of your property as well. Wood is one of the most reliable and one of the sturdiest materials in construction. However, it is susceptible to wear and tear from exposure to moisture and other excessive elements. If you have a wooden fence, you want it to last as long as possible. Not only does it provide privacy, but it likely enhances the beauty of your property as well. Check out this guide for weatherproofing your wooden fence. When it comes to fence maintenance, the first step is to understand the kind of wood. Various species of wood require different techniques. Redwoods and cedars are the best types of wood for fences because the natural oils help them resist the effects of moisture – rotting and mold. Other species will require a water-resistant finish to help extend their years, looks, and performance. Getting the dirt, dust, small insects, and debris off your fence is fundamental toward weatherproofing. Put it in your schedule to power wash your fence at least once a year, with a maximum pressure of 2,000 psi. Cracks might not seem like the kind of thing that needs immediate attention, but they are just the thing that can become a significant issue in the future. Cracks facilitate the spreading of mold spores and rot. They also compromise the overall integrity of the strength of your fence. Use a wood-safe cleaner to clean the area around the crack before filling them with epoxy. Wait for a bright, sunny day so that the epoxy has plenty of time to dry. 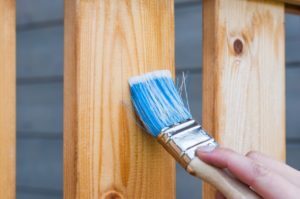 Most people associate wood stain with the look of the fence, but it also plays a vital role in protecting your fence from the weather as well. The right stain applied correctly will repel water and act as a barrier between the wood and direct sunlight, which can cause over-drying. Waxing also repels water and helps prevent fading. Hercules Fence has experience with nearly every type of residential and commercial fencing material imaginable, from wood and aluminum to chain link, vinyl, steel, and even temporary fencing. We have developed a reputation for quality work and fair, competitive prices. Hercules Fence is ready to serve you from six convenient locations. We have offices in Manassas, Richmond, Newport News, Norfolk, Virginia, Maryland, and North Carolina. If you have any questions about finding your dream fence or fence maintenance, you can contact Hercules Fence today by calling (757) 316-3600 or visit FencesNewportNews.com today for a free quote. This entry was posted on Thursday, April 4th, 2019 at 9:43 am. Both comments and pings are currently closed.